Jimmy Butler scored a playoff career-high 36 points in a losing effort on Saturday. 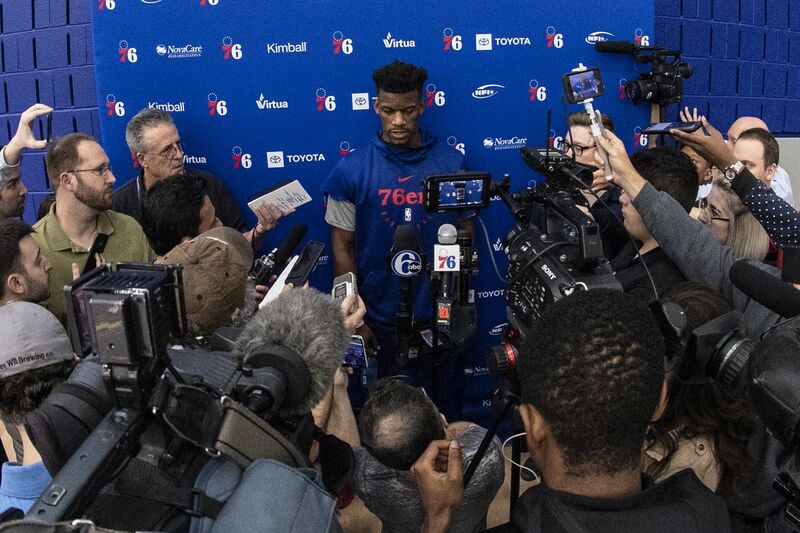 Jimmy Butler couldn’t have been more confident in himself and his 76ers team. That takes a little bit more convincing as the Sixers look to even the series with Monday’s 8 p.m. game at the Wells Fargo Center. After Sunday’s practice, Butler had a sunny outlook following his team’s gloomy Game 1 performance. He was really taking a positive outlook. It will be hard to make that a reality if the Sixers don’t improve on their 3-for-25 three-point shooting in Game 1. Even 12 percent three-point shooting couldn’t get Butler down. Joel Embiid is listed as questionable for Monday’s game on the NBA injury report with left knee soreness. (He was listed as doubtful for Game 1 and ended up totaling 22 points and 15 rebounds). Jonah Bolden who played 5 minutes and 7 seconds in Game 1, is listed as probable with left knee soreness. James Ennis, who has not played since April 3, is listed as doubtful with a right quad contusion, but this is the first time since being injured that he wasn’t listed as out. Ennis is supposed to be evaluated on Monday. Lost in the defeat was the solid performance from 7-foot-3 backup center Boban Marjanovic. In 15:23 backing up Embiid, he scored 13 points, hitting 5 of 7 from the field and 3 of 4 from the foul line. Marjanovic added three rebounds and four assists. He showed good shooting range. In the third quarter, he hit an 1-foot jumper and then a few minutes later a 19-footer. The last time the Sixers lost Game 1 and then won the series was in 2012. The Sixers lost, 103-91, in the first game at Chicago but went on to win the series, 4-2. Late in that first game, Chicago lost point guard Derrick Rose for the rest of the season with a torn ACL, and the Sixers won the next three games en route to the series win.